NextOn my stereo this week: ‘Light On’ by Maggie Rogers. Glenn Bidmead is one of the unsung heroes of Australian rock. He may not be a household name with the millennials, but his work spreads across all genres, everything from pop and rock to country. Interestingly, he has also co-written with many of my favourite artists such as Keith Urban, The Veronicas, Brooke McClymont and Mick Jones of Foreigner. As the primary creative force behind his new band Lemonjuice, Glen Bidmead, alongside The Dave Wilkins Band, is set to perform at the iconic Bridge Hotel in Rozelle next week. With their unique fusion of psychedelic rock and alternative pop, it is sure to be an energetic show, consisting of original songs from their new album The Sound Of Strawberry and an array of classic rock covers. With preparations and rehearsals well underway for next weeks show, the accomplished lead vocalist, guitarists and songwriter Glenn Bidmead was kind enough to find some time to catch up with me. Here is some of what we talked about. Glenn, you are lauded in the Australian music scene as a musician’s musician. Is that a compliment that sits comfortably with you? That’s a really nice complement to get, so thank you very much to whoever it was that made it, however, I look at myself as more of a songwriter, live performer and producer. My main thing has always been trying to write great songs and I also really love being in the studio, trying to make that elusive perfect record! Having said that, I just love playing live! Sometimes there’s nothing better than being onstage with a great band, in front of a great crowd of people, singing your own songs, playing noisy guitars and making a hell of a racket! I was hoping you might tell us a surprising story about working with Keith Urban and/or Mick Jones of Foreigner? As a fan of both, I’m intrigued how a working relationship like that comes about and its rewards. I knew Keith back when I was living in Brisbane. He had a great live band and we’d see each other at various gigs around town that we both did. At the time he was looking for songs and so I went around to his place to see if we could write something together. Keith was living in a garage underneath his manager’s house and he had it set up like a small flat. I remember when I walked in there were country records all over the place. I’d never seen so many and at the time I didn’t really know much about country music. I remember him telling me he was gonna be a country star. He was just so focused and determined. He was also very good at what he did. I think we spent hours just talking about stuff and I don’t even think we finished writing that song. And look at him now! He’s a big star and deservedly so! Being in that garage with him and seeing how single-minded and driven he was certainly had an effect on me. It was truly inspiring. Writing with Mick Jones from Foreigner was another great experience. I was in New York doing showcases for record labels and Mick had heard some of my songs. He’d asked if i’d be interested in writing with him while I was there. I spent two weeks in Manhattan and then a week at his home in Long Island. We had a great time hanging out and it was very exciting for me because this is the guy who had written so many big hits! We played Beatles songs, ate, talked, drank, and really didn’t get that much work done however we did write two songs together. One of them called “Something Good” I have a demo of with Lou Gramm singing which is a pretty cool thing to have. Once again, Mick was someone who was inspiring to be around, just because he had done it all. And again he’s someone else who is very good at what he does. A friend recently told me that your band is a real joy to listen to live. Are you actively honing your skills every time you get out on stage? I guess you are honing your skills but I don’t consciously think of it like that. I just love getting out there to play the songs. It’s also a bit more about playing with the other guys in the band as well, and how it all fits together as a unit. There’s also a bit of the unknown out there as every gig is different and sometimes songs seem to have a life of their own. Hopefully it all gels and comes off sounding pretty good. Lemonjuice’s new album is a nice return to form. When it came to recording the album did you take into consideration how it might sound live before laying the tracks? No not really. I wrote the songs and recorded them before there even was a band. I just assumed that they would sound the same live as on the record. In essence they do but, there is a great thing that happens when you get a bunch of great players all doing what they do best. I love the energy of a live band and the songs do tend to take a few left turns here and there but there is a great excitement that comes from that and the audiences seem to respond positively to that as well. Are there any songs from The Sound of Strawberry which have received a surprising response from fans at your shows? There are a few that keep getting mentioned. Boo Hoo always gets a great response. Sadhead is another one that people seem to like and also How Does It Feel which is a fairly trippy psychedelic dance/jam type of thing. I love playing that one live. The other nice thing is we are getting lots of comments from audiences saying how much they love the original songs. That’s gotta be a good thing! Finally, everyone has a favourite cover song they love to play. Which song do you love playing live? And why? Jet by Paul McCartney & Wings. I’ve always loved that song and the vibe of it really fits with the Lemonjuice stuff. It’s also a great rocking song live, I love singing it and the band play the hell out of it! 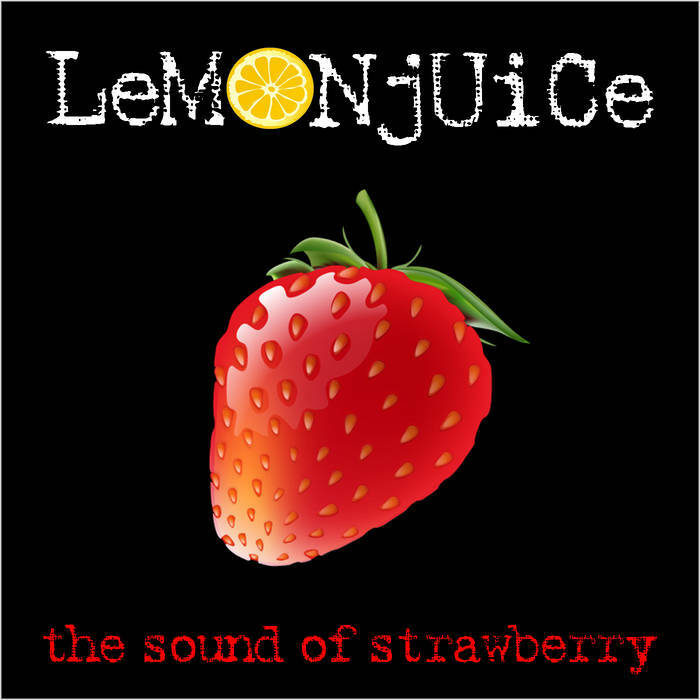 Lemonjuice’s new album The Sound Of Strawberry is available via Bandcamp. Tickets for Lemonjuice and The Dave Wilkins Band’s A Psychedelic Pop Rock Feast show on Friday 14th December are available at the door at $22 or $20 from Moshtix. For more information on Lemonjuice check out their Facebook page. Also, for more information on Glenn Bidmead, including a list of his live & acoustic solo shows across the Australian summer, check out his website. Photo credit: The header image is supplied by Lemonjuice’s publicist Vanessa Morello. I am not the uploader of the You Tube clip embedded here. Really cool interview Robert and thanks for introducing me to Lemon Juice they sound great and I will definitely explore more.